A new study issued by TRIP Inc. claims that driving on deteriorated urban roads costs U.S. motorists an average of $1,049 annually in additional vehicle repair needs, extra maintenance, higher fuel consumption and tire wear, plus accelerated vehicle deterioration and depreciation. TRIP said its 24-page report – entitled Bumpy Roads Ahead: America’s Roughest Rides and Strategies to make our Roads Smoother and released on Oct. 17 – examined urban pavement conditions, transportation funding, travel trends and economic development across the nation’s large (500,000-plus population) and mid-sized (200,000 to 500,000 population) urban areas. The group then calculated the additional costs passed on to motorists as a result of driving on rough roads, as well as charting the top 20 large- and mid-sized urban areas with the highest share of pavements in poor condition on major locally and state-maintained roads and highways, as well as the areas with the highest vehicle operating costs or VOCs incurred due to those pavement conditions. Based on 2016 data, TRIP said 33 percent of the nation’s major urban roads – which includes interstates, freeways and other arterial routes – had pavements that were in “substandard condition,” resulting in a nationwide total annual extra cost to motorists of $130 billion. 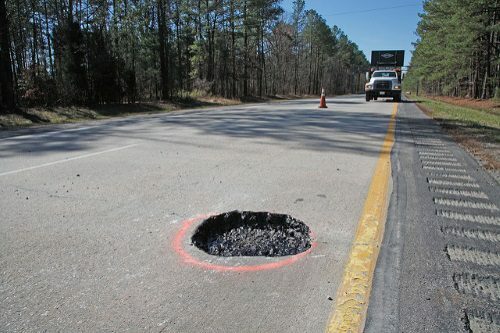 TRIP added that road conditions could deteriorate further as vehicle travel growth rates are returning to pre-recession levels and large truck travel anticipated to grow significantly, increasing the “wear and tear” on the country’s urban roads and highways. The group noted that vehicle miles travelled or VMT increased by 16 percent from 2000 to 2016 and increased by 6 percent from 2013 to 2016. Travel by large commercial trucks increased by 29 percent from 2000 to 2016, TRIP added, and is anticipated to increase by approximately 56 percent from 2018 to 2045, putting even greater stress on the nation’s roadways. TRIP added that USDOT’s semi-annual report on the condition, use, and funding needs of the nation’s surface transportation program pegged the current backlog in needed road and highway rehabilitation at $419.5 billion and that the nation’s current $41 billion annual investment in maintaining the condition of roads and highways should be increased by 33 percent to $61 billion annually to cover the cost of needed improvements.